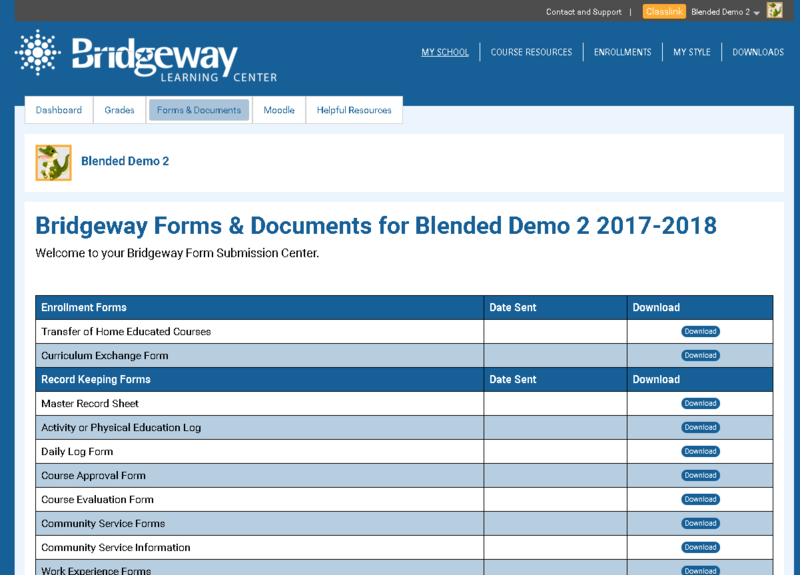 Forms and documents can be downloaded, edited and uploaded in the Bridgeway Learning Center. Most forms will not work on mobile devices. Students are able to view and download forms in the student login, but only parents are able to upload forms. Log in to the Bridgeway Learning Center with your parent username and password. Select a student from the dashboard. Select the Forms and Documents. After you download the form, you can open the .pdf document and fill it out and save the filled-out form. This is the form that you will upload. To upload a form, click the Upload link in the action column of the form. Browse for the filled-out form on your computer and select Upload File. If you have already uploaded the selected form before, but need to upload another version, select Upload New File and select the form type. Choose the "Form" from the dropdown menu. Click Choose file and browse for the file on your desktop. Click Upload File to complete the upload. Enter any comments in the Notes/Description box.